Raja Ampat is a wondrous archipelago, which is located in the easternmost of Indonesia. It belongs to West Papua Province, actually. 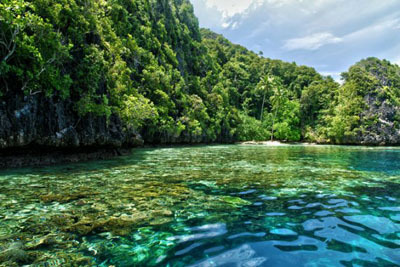 With its numerous options of islands, Raja Ampat provides unlimited tourist spots to travelers. The biggest island is called Waigeo and it is the home of a stunning beach called Yefpian. Unlike other beaches in Raja Ampat, this one is located near to the lush green hill. That means it doesn’t have a wide shoreline and the location is a little bit secluded. Despite the fact, tourists love to come to the location for relaxation. In terms of appearance, Yefpian Beach features clear sea water. Some tourists even consider it a natural pool. Some corals are also seen, which become the primary attractions for tourists. The size of the seashore is not quite wide, so tourists won’t be able to get around too much. However, they can explore the water wholeheartedly. This explains why Yefpian becomes a recommended spot for snorkeling. Both fishes are corals are beautiful, after all. Plus, the nuance is comfortable and soothing, as the beach is situated near to. Due to the limited size of the shoreline, Yefpian Beach is not suitable for beach walking. As an alternative, tourists can enjoy snorkeling, as the beach becomes one of the best spots to do so. The nautical beauty is even similar to that of Wayag. No wonder both professional and beginners are passionate to visit the beach. They have a sole purpose, which is to go either snorkeling or diving. The thing is no nearby facility is available, so they should have prepared the gear or equipment beforehand. At least, a hundred types of fishes live in the sea near to Yefpian Beach. Divers would meet all of them if they are brave enough to explore further. Moreover, there are also several types of corals, which are considered amusing. These stunning corals are located in different parts of the beach, so divers need to get around swiftly. For professionals, it won’t be a hassle. For those who are learning how to dive or snorkel, it is better to avoid getting too far to explore the sea. It is because the sea current is unpredictable sometimes. Another fun activity is swimming. This casual water sport is suitable for kids or those lacking skills to explore underwater beauty. Not to mention the water is warm and clear, which feels nice to the skin. Plus, it offers a wonderful visibility, so swimmers can even see the underwater views without any gear. Still, it is better to go snorkeling or diving for the best views. A route to Yefpian Beach involves several checkpoints. From Jakarta, the trip takes longer than those living in West Papua Province. First, tourists need to take an airplane to Marina Airport, which is located in Waisai City. Once they get there, they can simply take a local transportation service to Yefpian Beach.